Brandon Marshall begins the quest to raise mental health awareness in the toughest place there is: the NFL. 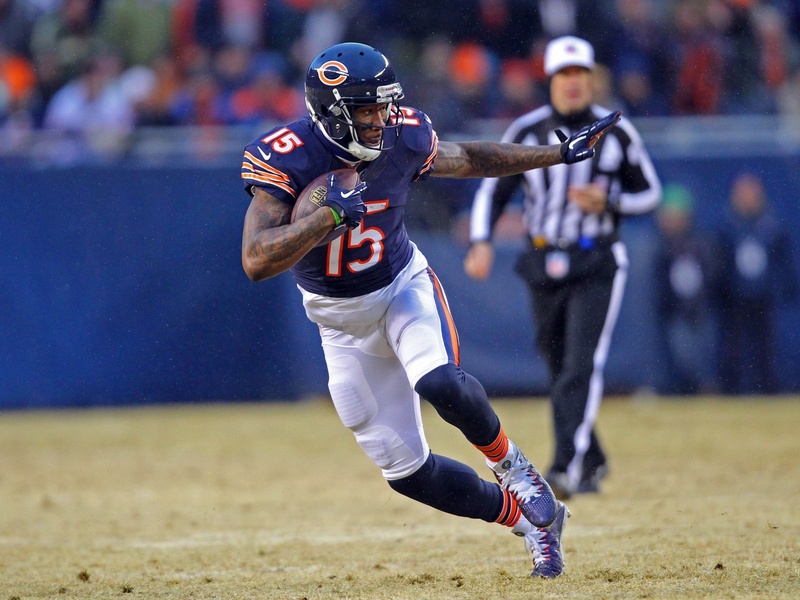 Brandon Marshall, a Pro Bowl wide receiver for the Chicago Bears, has a mental health disorder. Specifically, borderline personality disorder (BPD), a vicious and frequent emotional oscillation that can lead to instability in relationships, work, and thought processes. It is not one of the oft-fetishized and self-appointed disorders—some forms of mental illness being perversely desirable in popular culture, romanticized afflictions in the vein of aloof, cruel genius and functional addiction. In the NFL, where admitting even physical damage to the brain was long thought to be a shameful sign of weakness, to have someone of Marshall’s status be forthcoming about an invisible, non-trauma induced brain issue is borderline miraculous. After being diagnosed with BPD in 2010, Marshall, wanting to, as Marin Cogan wrote, “become for mental health what Magic Johnson is for HIV,” co-founded the Foundation with wife Michi. Correa is in the conference room of the Brandon Marshall Foundation’s fourth floor Ohio Street offices just north of the Loop. The Foundation’s offices are airy and minimal, all wood and glass and exposed brick. A massive chalkboard outlines the Foundation’s mission: “The way people think about mental health is CRAZY! That’s why our mission is to end the stigma attached to mental illness, advocate for unprecedented awareness, connect those suffering to resources, and paint the world lime green.” Reflecting off the various lustrous surfaces is the lime green accent wall, the color of mental health awareness impossible to ignore. As screaming as that shade is, those living beneath it struggle in silence. “The Brandon Marshall Foundation is focused on creating unprecedented awareness,” Correa says. A large part of that awareness is driving people away from their ingrained perceptions, from fearing those suffering on the fringes of society, and ignoring the struggle which undoubtedly fills their homes and offices. Here is where irrefutably successful people like Marshall come into play. For one to rise to such heights while living with BPD sends the message that not only can people with mental health disorders function, they can do so at the highest levels. Making Marshall even more uniquely suited to the struggle is the physical perfection required of his career. Charming and handsome, Marshall is not an immaculate champion, what with a litany of transgressions trailing behind him—including, most disturbingly, alleged bouts of domestic violence, one of which involved his apparent stabbing—but he may be the perfect one, especially as his run-ins with the law remain greatly reduced post-BPD diagnosis. According to figures commissioned by the U.S. Department of Justice in 2006, prisoners with mental health disorders account for more than half of the population in state and local jails (they fall just short of half in Federal lockup). They are also more likely to be repeatedly incarcerated-—one-third in comparison to the one-fifth rate of psychologically healthy inmates—as well as qualify as substance abusers, have recently used illegal substances, or been previous physically and/or sexually assaulted in the past. In seemingly extricating himself from so dark a trend, Marshall covers himself a patina of grace. Redemption narratives, in reducing people to paragons, are fraught with peril. But they are admittedly romantic, dramatic, and potentially inspiring. It’s easy to view Marshall’s efforts as such. What makes the Brandon Marshall Foundation—and its namesake—unique is the confluence of embattled, partially-saved figurehead and fight. A man perfectly suited to placing upon his shoulders the struggles of centuries of misinformation and fear has shoulders broad enough to do so publicly.